March–May - This is a magical time for our inland trout streams as everything starts to come alive. Snowy banks will give way to blossoming streamside flowers, hatching mayflies, and warmer weather. 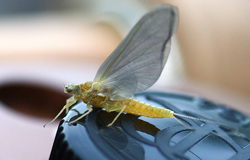 The beginning part of the spring will be great for fishing nymphs and streamers, while the middle and end parts of the season will be really good for dry fly fishing. 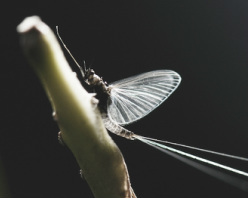 In March Hendrickson nymphs start to position themselves for the up and coming hatch along with little black stones, so do the trout, and we can put you in position to take full advantage. It is also the time when we see a big midge hatch on our local spring creek, where the dry fly fishing can be fantastic….but you better be ready to fish small! April will bring the first major mayfly hatch of the year – The Hendricksons! And depending on air temperatures, we can see them come off from late morning into the afternoon with spinner falls coming in the late afternoon to evening. They will start off at around a size #12 and end up being around a size #14 or #16 by the end of the hatch weeks later. They are followed by BWO’s in a size #16, not the small beatis that can hatch year round which are more of a size #20. May is the time when everything starts to bust wide open. We will see multiple hatches of Caddis and the start of the sulphurs. The caddis will range from a tan #14 to a black #20 and everything in between. The sulphurs that start at the end of the month come off in the riffle sections and will start at around a #12 and end up being a#16 by the time there done in early June. We can also see some green drakes as well. June-August - The great dry fly fishing continues with plenty of caddis and mayflies around. Fishing can get a little tricky later in the summer when low water levels can make for some ultra spooky trout, but fear not, we’ve got it covered! June will bring the smaller sulphurs (#16-#18) and the start of march brown/grey fox, large cinnamon/brown caddis, and olive caddis. Yellow stones and Isonychia round out the end of the month. The only tough part now becomes picking the right fly for the right hatch. Fishing late in the afternoon will be the time to get in on the hatches, and then again in the evening for the spinner fall. By the middle of July, and sometimes earlier, we see a major change in the character of the stream and the fish. We now are in the heat of summer, and with it brings low water and sometimes very spooky trout. It also will bring the longest mayfly hatch of the year – The Tricos!! At the start of their hatch period the duns will come off very early in the morning with the spinner fall happening a few hours later. It is usually done by 9:30-10:30am. These tiny mayflies (sizes #20-#26) will continue to hatch up until the first frost, which usually takes place in October. And as the hatch progresses into early fall they will come off later and later and become more and more sparse. Terrestrials like beetles, hoppers and ants are always a good choice as is fishing at night with mouse patterns. August is very much like July with the continuation of fishing tricos, terrestrials and night fishing with mouse patterns. September-November - Fishing inland trout streams during the fall can be a complete joy as there very few anglers around due to the tributary season heating up, and the change of colors in the leaves can be breathtaking. September will also be very much like the tail end of July and August with tricos still available along with terrestrials and again some good night fishing on top. October usually brings the end of what is left of the tricos, terrestrials and night time fishing. But with the cooler weather and fall rain, we will have a great opportunity to get back into good streamer fishing and on warm days even fishing the October caddis hatch. We will also start seeing leaves coming off the trees which can make fishing a little challenging. The cooler weather continues in November along with major leaf issues on windy days. But the fishing can be fantastic as the fish gear up for winter and the up and coming spawn. Nymphing and fishing streamers will now take over as the best method to take fish, but you can also find success casting dries on cloudy days with small BWO patterns. December-February - As the cold of winter tightens its grip on WNY, our inland trout streams remain in great fishing condition. In fact they can be our saving grace when all the area tributaries to the great lakes are too high to fish. Streamer fishing continues to be great, especially with high water periods, but it may become too much to deal with during the very cold periods from late December through early February when day time temperatures struggle to get above or near the freezing mark. The most successful way to take fish on a consistent basis will now be nymphing. Small egg patterns, midges, hare’s ears, pheasant tail nymphs and a few of our own special creations will be the way to go until the spring brings everything back to life again. Generally from June to July. Mornings and evenings. Amazing spinner falls! Generally from late April to May. Spinner fall can be prolific! Generally from July to late August. Very technical! Long leaders, clear water and spooky fish.